I made a graphic! Yaaay! Again, anyone fluent in Japanese is free to comment with corrections. Right now ayu has one more entry up for the 15th which will be translated on my next update, like this Wednesday maybe. I unfortunately don't have the time to do it right now. 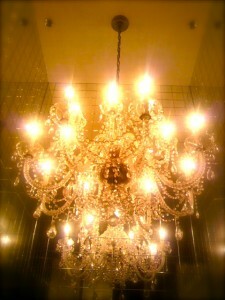 In this installment, Ayu shows us the dreaded chandelier, celebrates a friend's birthday, and has an F My Life moment at the train station. As one would expect, the earthquake yesterday shook everyone awake~. I got alot of messages saying stuff like "WELL I'M CERTAINLY AWAKE NOW!!!!" So yeah, everyone in the area was feeling pretty scared, it seems. This morning, I am updating my blog, so please read it! So, okay, cuz of this & that & the other thing, I couldn't come here, but there's really no reason why I didn't, I just didn't. Sooooo--------- much fun. Teehee. Teeheeheehee. Oh no, what if I don't make it! Everyone, please wish for my warping to succeed! Still, with my M-Sta outfit, the shape of me leaping onto the bullet train at Tokyo Station, even if I somehow floated, people would be like, "No way that's Hamasaki Ayumi that we're seeing there!!".. SO. This computer's new, so it's not decorated yeeeetttt~. Lastly. I got alot of requests for photos of the chandelier that you all heard Chonmama was desperately protecting the doggies from falling on them. 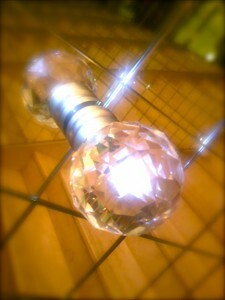 By the way, all the doorknobs here are sparkly crystal now. In these tiny little ways, Chon-san's house is like, open to the public. *She said "PASO-ko" here... the "PASO" from "PASOCON" or Personal Computer, and "ko" meaning child. So I just called it "compy" here. **She said "NEW" in english, so I put "atarashii" in japanese here. ***M-Sta is short for Music Station. I traverse the distance between TV Asahi and my friend's place in Nagoya. After M-Sta ended, I flew out of the studio, not much to say about the ride in the car. On my journey to Tokyo Station. I was cut off from everyone though, so even with such a huge team there to see me off, I had to make a mad dash for the escalator. 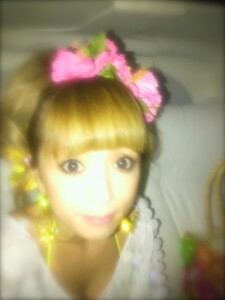 Having already gotten the whole way up, Bancho (Kanako Miura-san) took a photo on her phone. So, here again we had to make a dash to get onto the bullet train successfully-----------. The staff & I, not hampered but all sweaty, face the window. So, at Nagoya Station as usual, after getting jostled with a big fever, we arrived at my friend's place. Having seen M-Station, my friend said "You came without changing?! Wow!!!" and smiled alot. With that, I finally was able to change clothes, and I just kinda watched from there as everyone celebrated, since it was the Takami Clinic director's birthday yesterday. "You, I guess welcome~<3!" my friend said, but as far as a compliment, I should be able to handle that because it's good, right? Sensei. Anyway, after that, the moment it became midnight, it was officially that person's birthday. I'm digressing, but, the flowers that Bancho has in her hair, she said "You dropped this," to an average Salaryman guy at Tokyo Station, and she very suspensfully handed them to him, and instinctively I throw out a "Thank you very much," but it's all suspenseful again as I take them, and then realize that they are flowers I don't actually recognized upon seeing them. I was certain, but even though it's good to have a head full of flowers, even though the situation did totally confuse me, the fact is, the flowers did not fall from my head. Seriously, I will always love this three-item set from Takami Clinic. Let me introduce you to it~. I always have about 30 of these stocked up. (Is that alot? I'm useless without this stuff. You'd do the same if you were me. Next, Takami Sapuli!!!!!!! This also is very powerful stuff that my life depends on, and I love it. And then last up, this!!!!!!! This is the skin primer I mentioned awhile ago, that makes my skin all ni~ice. Actually, you can see the Takami Clinic home page... I think. So yeah, I'm going to the gym now~!!!!!!!!!!!!! I must be in peak shape---------! !